I've made this every night for the last two weeks. I'm in a bad dessert habit, leftover from the wedding, I think. We don't keep anything sweet in the house so if you want something, it has to be made. Luckily (unfortunately? ), pudding is so, so easy. I don't know why people buy mix. The original recipe is from Smitten Kitchen, but I make a half batch and I've modified it a little bit to suit my needs (less sugar, less cornstarch, no egg white). This gives you a soft, not overly rich pudding that is just a bit sweet. It makes me feel a little better about eating the entire batch in one sitting. :: Heat 1 cup of milk in a small saucepan. 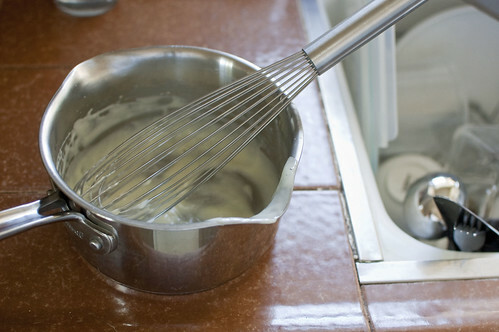 :: Meanwhile, whisk together the extra 1/3 cup milk and the egg yolk. :: In a heatproof 2 cup measuring cup or bowl, whisk together the cornstarch, sugar and salt and then add the milk/egg mixture in a slow stream, whisking so clumps don't form. :: Slowly pour the hot milk into the mixture, whisking the entire time. :: Pour the entire mixture back into the saucepan and cook for a few minutes, until thick and bubbling. :: Stir in the vanilla and eat warm (my preference) or let it cool and set up a bit. If you want chocolate pudding you can toss in some chocolate chips after it's done cooking and whisk it well. I usually just toss in a small handful, but you can start small and then add to taste. The entire procedure takes maybe 10 minutes, tops, and that includes washing out the measuring cups (naturally I can't wash the pan until later - you guys know that washing hot pans warps them, right?). I really need to start weaning myself off the whole dessert thing. Not that I should convince you to wean yourself off of dessert (lest there be fewer recipes around here), but I often find that a piece of really good fruit or some yogurt or a cup of herbal tea is a good tactic to have. I have gotten myself into an afternoon snack habit, which mostly involves hot chocolate...I should break out the fruit and tea. 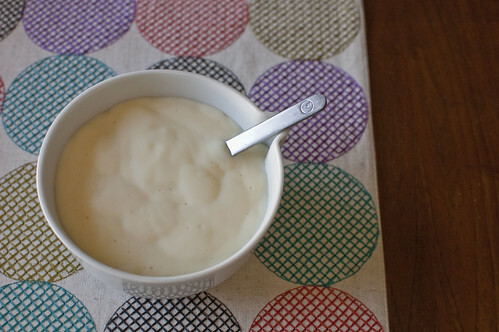 Oh my gosh, I never thought of making my own vanilla pudding! I will have to try this, thanks for sharing!! I'm a big pudding fan too. I love it when it's served warm. Sooo comforting. I love your table placement too. The colors are so fun! i too have a "dessert situation" happening right now. specifically with pumpkin flavored pastries. i'm ready to send a distress signal. i am going to make this right now...with my kidlets...oh the joy of homeschool! ooh this looks divine. and nah, live it up with the desserts. This looks tasty. It reminds me of some chocolate mousse I once made. Homemade puddings are nice. This looks so delicious. Thank you for sharing. I've thought about weaning myself off of desserts for years now but so far, no dice. this is annihilating my vegan willpower. @ lauren - perhaps with coconut milk? maybe i'll try that tonight. oh, but the egg is still an issue. man, once you get out of the vegan mindset, it's hard to get back in it. i used to be able to come up with vegan subs easily. you could make the coconut rice puddingcoconut rice pudding. that one is vegan. and wow, it was so great to see you guys...what a nice surprise! i know you are on the west side, but let's get together soon! welp. looks like i have a new after-dinner treat. danke. i did not need to know that this was possible... i'm now trying to convince myself to go to bed instead of to the kitchen. gah!! must try. Thank you for sharing your receipt with us! I tried making this last night - I added cocoa powder to make chocolate pudding. It was a bit on the sweet side, I think next time I'll add just half the amount of sugar and maybe a tad less vanilla. Great easy recipe, and perfect for the winter. I had no idea how easy it was to make pudding from scratch, and will no longer be buying the packaged kind at the store. We don't keep sweets in the house either. It's so much more fun to go out for an occasional treat, plus, I don't trust myself alone with a cabinet full of sugar... But when the urge hits me, I will definitely turn to this recipe. I didn't know pudding was so simple and these are ingredients I always have in my kitchen. OH, NO! This sounds too good! Love vanilla pudding - just came across your blog and love it! If you add some cinnamon and a hint of chili powder, it is very very very good! This also works well with almond milk! Just did this, exactly per instructions, and turned out great!